Investment Administration has a key role to play in the many and varied investment products and services that are available in the retail investment marketplace. 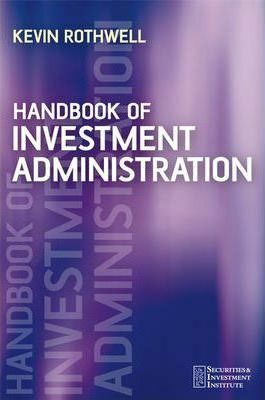 Kevin Rothwell's Handbook of Investment Administration provides a comprehensive and readable source of both background and practical information for the practitioner. The Handbook takes the main aspects of investment administration and drills down into the detail of these from a retail perspective. It covers areas that are unique to the private client business such as trusts. It explains the background on why processes are undertaken providing as essential reference aid for the practitioner. Key features include:* A full range of Investment Administration functions from New Business to Settlement through to Corporate Actions. * Specialist areas such as Trusts and Charities are covered in depth. * Concise introduction to each subject providing interesting background information, followed by a detailed review. * Essential reading for candidates undertaking Securities & Investment Institute IAQ exams examinations.